Airsoft Softwair - the hardest working men in code business - are proud to present version 2.0 of the Hollywood APK Compiler. This program allows the conversion of Hollywood applets into stand-alone APK packages that can then be published on the Google Play Store or distributed in an other way. 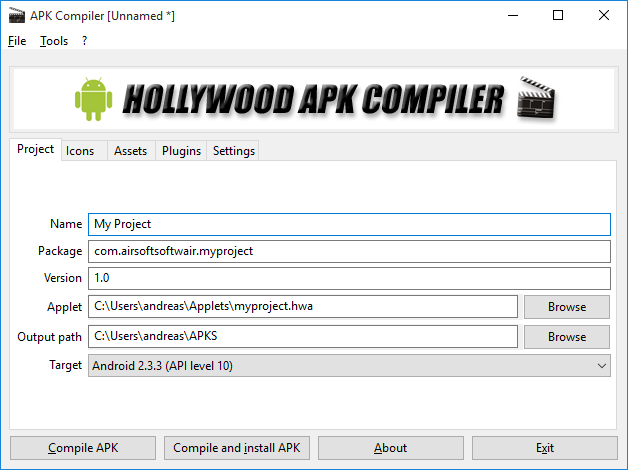 Once the Hollywood APK Compiler has been set up, the conversion of a Hollywood applet into an APK file takes only a few seconds. 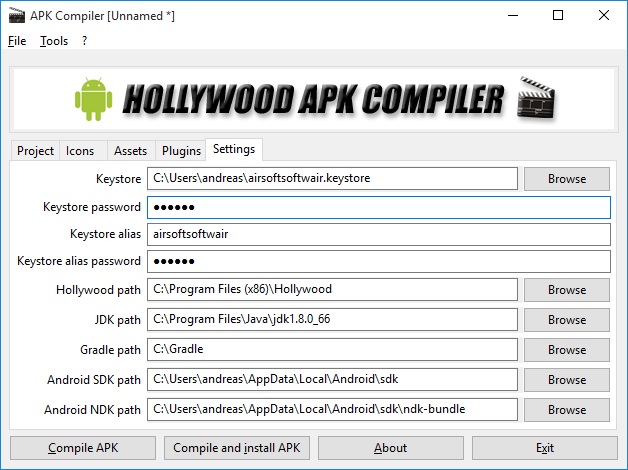 Additionally, the Hollywood APK Compiler can also install the generated APK file onto an Android device connected via USB. Version 2.0 is a major update that adds support for the Gradle build system. A few months ago, the Android SDK build system was changed from Apache Ant to Gradle. The Hollywood APK Compiler now supports this new build system. Version 2.0 also erases the dependency on Cygwin meaning the Hollywood APK Compiler can be used without Cygwin now. Finally, version 2.0 also allows you to set the Android target version. If you set this to 3.0, your app will no longer be marked as "Designed for phones" on the Play Store. This update is provided free of charge for all licensees of the Hollywood APK Compiler and can be downloaded from the restricted download section. People who've already installed an older version of the APK Compiler and wish to upgrade please do note that since so many things have changed under the hood in the Android build chain, you'll have to install the latest Android Studio before the new version will work. Please follow the installation instructions in the manual. Rock'n'roll! Man, do you ever sleep? Click on the "SDK Tools" tab and select the items "CMake" and "NDK". Then click "Apply". The SDK Manager will now install CMake and the Android NDK which are both needed by the Hollywood APK Compiler. CMake is not in my list, i can see NDk, SDK, Emulator... but CMake don´t, any idea to solve this? Have you installed the latest Android Studio? Hmm, weird. Maybe it is already installed? Can you try to run the APK Compiler and see if it's working? And you're really using the latest Android Studio 2.3.1 for Windows? I.e. the one from here: https://developer.android.com/studio/index.html ?